The multi-part Eldar codex review now turns to a part of the Eldar army that gets somewhat less attention (and definitely less attention with all the talk about the new Codex), but that makes up a major part of many Eldar armies, and will hopefully come back to prominence with the changes to the Wave Serpent: the Grav Tanks. If you’re just joining us, click here for HQs, Troops, Aspect Warriors or musings on the aesthetics of the new codex. Since they also need to be covered somewhere, I’ll also be covering the units that don’t easily fit anywhere else in the review: War Walkers, Vaul’s Wrath Batteries, etc. Grav Tanks took a bit of a hit in the last edition of the Codex, and I think the changes to 7th Edition put the nail in their coffin a bit. I saw very few non-Wave Serpent Grav Tanks at the LVO, and people are routinely (and justly) surprised when the Fire Prism normally in my list does much. The problem was the one-two punch of the Wave Serpent and Jink. The number of S7 shots the Wave Serpent could put out meant for many purposes, it was superior, or at least not meaningfully inferior, compared to other tanks – and was cheaper, held more troops, was more survivable and more flexible to boot. The change to Jink that mandates snap shooting was also rough – the Falcon has a low number of shots, and much of the shooting from the Fire Prism and Night Spinner is template based, meaning they have to choose between being able to shoot, and being able to survive. Some of this has gotten better. The Wave Serpent has been redesigned. Some of it remains the same – so where does that leave us? Falcon. 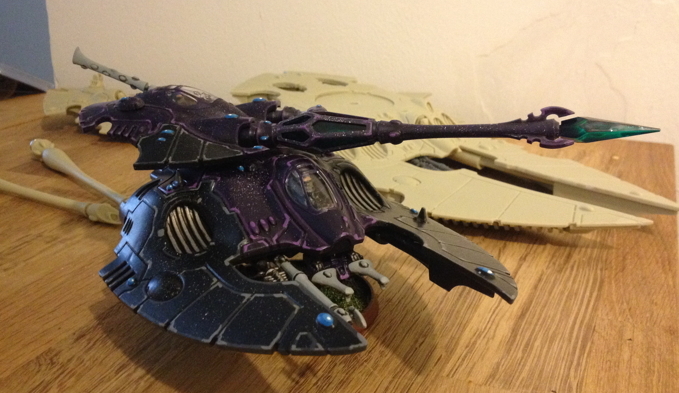 Perhaps the most iconic of the Eldar Grav Tanks, the Falcon has returned to it’s position as the premier “Gunship” tank. Priced the same as previous, the changes to the Falcon are fairly subtle. The first, of course, is that the free Scatter Laser no longer has Laser Lock, killing the option to have a cheap means of twin-linking the built-in (and excellent) Pulse Laser. The upgrades to a Star Cannon or Bright Lance remain pretty inexpensive however, letting you choose whether or not to go towards a heavy infantry killer or an anti-vehicle platform. One of the important changes is the ability to take Falcons in squadrons of up to three, ensuring that these don’t take up too much of the (very) crowded Eldar Heavy Support choices. If taken in a squadron of three, they can Deep Strike without error if they’re within 4″ of one another, similar to the old Apocalypse formation. Definitely a nice bonus, and when combined with some other tricks from the Dark Eldar could make for an absolutely vicious beta-strike army, but for a minimum of 375 points and likely considerably higher than that, it’s definitely an expensive way to go, and a lot of your army off the table. Jink has been made slightly less punishing thanks to the changes to Holo-fields, which I discussed speculatively here, and which did indeed pan out. The 5++ means there’s now a choice between Jinking and needing to snap-fire versus potentially taking more hits but still being able to fire at full BS (though huddling behind cover is still preferable). Despite all of this, I remain a little concerned. The Wave Serpent didn’t displace the Falcon as the Grav Tank we saw used a lot on the field. The dominant 5th edition way to play Eldar were as a ground-pounding army, with the occasional Falcon splashed in as a transport for suicide Fire Dragons. I’m not convinced that the Falcon had a niche the Wave Serpent did better – I’m concerned that the goodness of the Wave Serpent made that niche. There’s definitely cause to take a Falcon now, but it’s not quite grabbing me and screaming “YOU CAN TAKE THREE NOW!” in the way I was hoping for, because I love me some Grav Tanks from a visual and fluff perspective. It just looks like something that’s going to hurt when you get hit with it. But do the rules back up the model? I think the answer is, again, a resounding “maybe”. At the same price as it was previously, the Fire Prism remains pretty expensive. In the open, it’s marginally more survivable with the change to Holo Fields, but given how easy it is to shut down through weight of incoming fire, if you can find ways to get a better cover save than a 5+, do that. Two rules make the Fire Prism potentially more viable. The first is the ability, like the Falcon, to take the Fire Prism in squadrons – making it easier to take multiple Fire Prisms, rather than putting all of your High Strength Low AP shooting in one crystal basket. Taking two or three of these, especially if they can be buffed up with psychic powers, should definitely give your opponents pause, while still giving you room for other toys. The second rule, Linked Fire, makes the Fire Prism able to combine fire between two or three tanks, raising the strength by 1 and lowering the AP by 1 for each contributing tank. When firing in the S9 AP1 Lance mode, this isn’t all that important. However, the S5 AP 3 Large Blast can easily become a terminator-killer with the addition of a second Prism, and the Strength 7 AP 2 Blast could be nudged up to make things very dangerous for multi-wound T4 models. The good news is you don’t need to designate these ahead of time, so you can balance the weight of fire from 2 or more tanks versus putting all their firepower behind one nasty shot. Note you still have to be able to shoot normally, so forcing a Fire Prism to Jink can also shut down fire linking. I don’t necessarily think the Fire Prism has reached some new height of effectiveness, but the 5++ save from Holo Fields could make it a little harder to shut down, and if your local meta heavily features Knights, Land Raiders, or other high armor vehicles, the Fire Prism is your answer, and two Linked Fire Fire Prisms will make your local Deathwing, Wolf Guard Terminator or Grey Knights player cry. Night Spinner. The other model in the Fire Prism kit, this tank too is all about its gun. Notably however, the Night Spinner got a hefty 15 point discount over its previous version. The Night Spinner’s gun, a Doomweaver is a massive version of the Warp Spider’s gun discussed here. A S7 AP6 Monofilament shot (6 to wound = AP 1 and To Wound is versus Initiative) that comes in either a Large Blast Barrage or Torrent form. The same caveats to the Fire Prism exist – if the Night Spinner is taking fire, it’ll be easy to shut down if it Jinks, which is my primary concern with the tank, though with Barrage it may be easier to hide the Night Spinner. Night Spinners can also be taken as squadrons, and if they combine their fire they add +1 shot and +1 S per tank joining in. That’s potentially very nice, either for messing up closely parked tanks, or playing merry hell with Tau Battlesuit units or other very low I units. The tank remains highly situational however, and not something I’d necessarily rely on. However, with the purchase of an extra turret from Ebay, it’s easy to magnetize a Fire Prism/Nightspinner combo for just that kind of situational goodness. Vypers. The heavy jetbike-thing only a mother could love in the last codex, it’s important that Vypers get better because they’re a mandatory unit in a number of formations, and it would be nice if they weren’t simply a straight tax. 10 points cheaper than they were, they’re now substantially discounted, though the points costs for their weapons remain the same, and they’re still AV 10 all-around, 2 HP and open-topped vehicles, making them vulnerable to bolter fire, let alone dedicated anti-tank weaponry. The weapon choices put you in a curious place – the easiest involves spending 50 points a model for two Shuriken Cannons, but this is adding more S6 firepower to an army that, as we’ve seen from the jetbikes, hardly lacks in S6 firepower. Mounting more expensive weapons makes the fragile Vypers pricier, and while they can now take on tanks, half of their weapons will be wasted unless you can slide into a rear arc. Vypers can also now be taken in a squadron of six, which is admittedly an absolute truckload of firepower in a single unit – and means if you do want to use Vypers as your source of weight of S6 fire, you can do it while still being able to take other Fast Attack choices. I think being substantially cheaper will make the Vyper a more interesting unit, and you’ll certainly see more of them on the table, though whether to keep them as Venom-style anti-infantry gunboats or trying to sneak higher S weapons into them is something I think is not yet super clear. Part of that may depend on overwhelming your opponent with threats – if you can make them panic about your jetbikes and ignore your vypers, they may indeed be able to run rampant through your opponent’s backfield causing all manner of havoc. War Walkers. Like Vypers, but marginally more survivable thanks to a 5++ save built in, they’re a slightly more cheaper means of getting the same type of “mobile firebase” role that Vypers (when you upgrade the Vypers enough to compare like-with-like) though they’ll come with a smaller maximum squadron size of three. With Scout, Fleet and Battle Focus, they’re good for getting themselves well positioned, and adding Star Engines may allow them to be truly mobile, or able to duck in and out of cover reliably, though at a fairly high cost. As with the Vyper, they can take a large amount of heavy weaponry, and I think they’re somewhat more suited for this role than the Vyper, because they can replace both weapons with heavier guns, and thus they don’t face the prospect of “wasting” one of them firing at an inappropriate target. Armed with two bright lances each, a squadron of three War Walkers is a pretty formidable glass cannon. Sadly, the most obvious weapon load-out of “a Scatter Laser plus something” to keep costs down and help work as an AA platform is gone. Eldar Missile Launchers are the most flexible option and now have anti-air missiles built in, but two of them will increase the cost of the unit by ~50%. That’s a workable solution to anti-air, but if that’s covered by other parts of your army, I wouldn’t bother – the flexibility of the EML is offset by its cost, and the anti-infantry component being widely available in all the troops choices in the army. In my mind, double Bright Lances make considerably more sense if you’re looking for higher strength, lower AP weaponry. It might be useful to tuck one EML in the squadron for “emergencies”, but I’m not convinced it’s necessary. Vaul’s Wrath Support Batteries. The bigger, and much less mobile cousin of the heavy weapons platforms that come with Guardian Defenders. Again, these have shown up as a mandatory unit in a number of formations, so suddenly their effectiveness is much more important, as they’ll be harder to just ignore. Thanks to Battle Focus, they may be marginally more mobile than your ordinary artillery, but they’re still largely stationary gun platforms, crewed by two Guardians armed with shuriken catapults (protip: If these are fired in anger, something has gone very wrong) and a T7, durable artillery platform with a single heavy weapon. A unit can be up to three such gun-and-crew combinations, and there’s the option to add a Warlock leader to the crew, which is an interesting option, as a few of the Runes of Battle powers can potentially make the guns even more durable. They automatically come with a baby version of the Night Spinner’s gun, a S6 AP6 Heavy 1 Barrage Blast with the Monofilament rule. This isn’t capable of being strengthened with combined shots as with the Night Spinner, and again, it’s highly situational – it will play bloody havoc with low initiative infantry, and barrage is nice, but it feels situational. This can be swapped out for a S7 AP4 Heavy 1 Vibrocannon which causes pinning (a bonus I’ve rarely if ever really benefitted from), but importantly can be combined with multiple shots, each shot after the first that successfully hits reducing the AP by 1 and increasing the Strength by 1. So two hits would be hitting at S8 AP3, and three at S9 AP2, potentially making a decent anti-tank gun, and in a pinch an anti-infantry gun, though with such a small number of shots, only against high value targets, preferably those that can be doubled out. Sacrificing half the range (24″ instead of 48″) and paying a fair chunk of points lets the artillery swap its gun for a D-cannon, which does basically what it says on the tin – Strength D AP2 Heavy 1 Barrage Blast. This is a nice gun, and one of the few ways to actually work the Strength D ranged weapons everyone is upset over into an army without including Wrath* troops. The range however will put them at greater risk, and 3 Strength D shots, while nice, will not necessary guarantee the death of anything headed toward them, and large-size infantry units are essentially a hard counter. Using it appropriately will require a more aggressive deployment and using the D-cannon as an area-denial weapon and a threat to high value targets, but in that role it is certainly extremely dangerous. Now that they can hold objectives, a unit of these could be a very solid means of holding a backfield objective, and with a variety of weapons, they can fulfill anti-tank, anti-infantry and anti-elite infantry roles, though you should likely pick just one to go with for a unit, especially for the Vibrocannon.